The career of this legendary beauty (born Estelle Merle O'Brien Thompson) reverses the received wisdom that British cinema produced nice, "natural" girls while Hollywood was all glamour and artificiality. 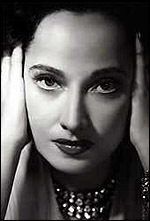 With Indian mother and Irish father, Merle Oberon grew up poor in India, came to England in 1928 and reinvented herself as Tasmanian, deciding that the racial mix would do her career no good. Spotted by Alexander Korda who built her up as a sort of gorgeous exotic, but gave her very little of consequence to act, she is briefly touching as Anne Boleyn, hoping her hair will be in place when her head falls, in The Private Life of Henry VIII (d. Korda, 1933), and her exquisite, raven-haired beauty is aptly used in The Scarlet Pimpernel (d. Harold Young, 1935), with whom - that is, Leslie Howard - she had a real-life affair, before taking Korda as first (1939-45) of four husbands. At the end of the decade Korda put her into two mild comedies, for which she had virtually no gift, but for the first time she was seen in Technicolor and that was indeed a bonus. The great pity of her British career is that her near-fatal car crash led to the shutting down of Joseph von Sternberg 's production of I, Claudius (1937). It was made the subject of the documentary, The Epic That Never Was (BBC, 1966); the surviving footage suggests that von Sternberg might have done for her what he so signally did for Dietrich . She filmed in Britain only twice after settling in Hollywood: the ludicrous flag-waver, The Lion Has Wings (d. Michael Powell, 1939) and the dawdling romance 24 Hours of a Woman's Life (d. Victor Saville, 1952). She went to Hollywood in the mid 1930s and the films she made there, especially These Three (1936) and Wuthering Heights (1939), both directed by William Wyler, showed a new unaffectedness in her acting. She spent most of the rest of her career there, in films good and - as the case often was - bad (think of Night in Paradise (d. Arthur Lubin, 1946) as a princess in love with a young man called Aesop, of fables fame). For the susceptible of a generation, though, it hardly mattered what she did (and she did George Sand in A Song to Remember (US, d. Charles Vidor, 1944) unforgettably); she was simply one of the world's great beauties, and stayed so for several decades. She did some US television in the 1950s, but her film career quietly tapered off. Her second husband (1945-49), ace cinematographer Lucien Ballard , made her look ravishing in some dim films; third was industrialist Bruno DePagliai ; and fourth was minor actor Robert Wolders . Her strange and affecting true life story was the subject of Michael Korda 's shoddy best-seller, Queenie (1985), made into an even shoddier miniseries (1987).